Ok…this might sound totally geeky or nerdy but I don’t care. I was having dinner with my bro tonight and I asked him how WONDERCON was this weekend. Last Saturday I was debating whether or not to go and the only reason why I wanted to go was because I had read that there was going to be a guest appearance by someone from the Star Trek movie. I was hoping it would be Chris Pine, but I didn’t think he’d be there. So I didn’t go. And of course my brother tells me he was there! UGH! 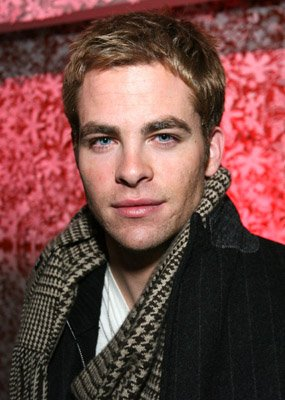 This is probably one of Chris Pine’s biggest movies. The only movies I’ve seen him in is “The Princess Bride 2”, “Just My Luck” (w/ Lindsey Lohan), and “Smokin’ Aces”. I was surprised (in a happy excited way, haha) to see he was playing Kirk. Some of the other cast members include John Cho (Harold from “Harold and Kumar”), Winona Ryder (Whaaa?! ), and Eric Bana. Anyways…my bro just sent me the new trailer for the movie. Peep it!